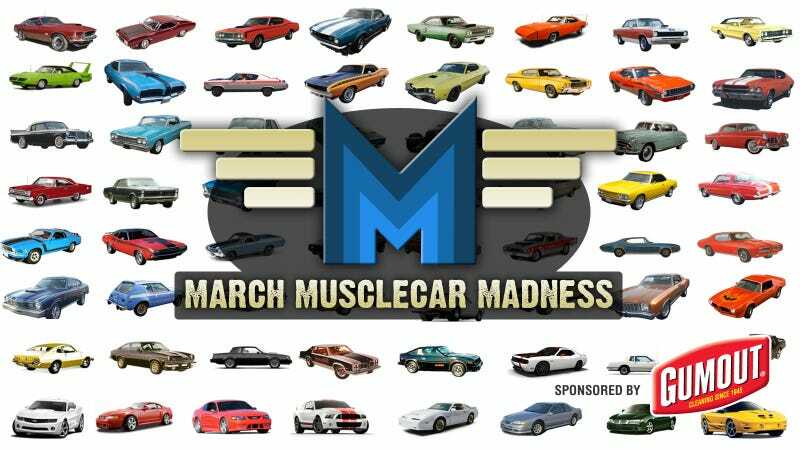 It's March Muscle Car Madness Time! I'm sure most of you know March Madness (not the breeding season for European Hares, the basketball one) officially begins tomorrow, and, of course, we at Jalopnik don't like car guys getting left out of anything, so here's our plan: We're going to do a March Madness tournament of our own. Of course, being Jalopnik, we're not doing a basketball tournament. There's no cars involved at all! Not even a Zamboni! Instead, we're going to do a massive month-long showdown of the jocks of the car world: American muscle cars. Here's how it'll work. We've picked 64 muscle cars, and divided them into four regions. We'll use the bracket down below for the pairings, and the "games" themselves will be handled via polls. Most votes in the poll wins the match, with the winner going on to next round. When it's all over, we'll have one triumphant muscle car winner, and, more importantly, the fans of 63 muscle cars — backfiring and leaking bittersweet coolant on the rug — as angry, bitter losers. Since you're probably going to want to start doing your intense research, the full list, by region, is below, along with a picture of all of them, useful for wrapping paper. Matches start this Thursday at noon, so fill in your brackets for your illegal pools today! Muscle Car Madness is brought to you by Gumout.